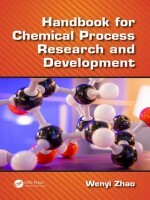 The Handbook for Chemical Process Research and Development focuses on developing processes for chemical and pharmaceutical industries. Forty years ago there were few process research and development activities in the pharmaceutical industry, partially due to the simplicity of the drug molecules. However, with the increasing structural complexity, especially the introduction of chiral centers into the drug molecules and strict regulations set by the EMA and FDA, process R&D has become one of the critical departments for pharmaceutical companies. This book assists with the key responsibility of process chemists to develop chemical processes for manufacturing pharmaceutical intermediates and final drug substances for clinical studies and commercial production. • Provides readers with a full spectrum of process R&D (17 chapters) with case studies, experimental procedures, and in-depth discussions. • Promotes an industrial mind-set concerning safety, cost, environmental impact, and commercial viability when developing chemical processes. • Uses a mechanism-guided process development (MPD) approach to diagnose problematic chemical processes and solve challenging process problems.